Preheat oven to 400 degrees. Put cornmeal in medium mixing bowl, pour boiling water over cornmeal, and mix well. Set aside to cool. In another mixing bowl, combine remaining ingredients and blend well. Add cornmeal mixture to other mixture, and blend well. Let the mixture sit for 10-20 minutes. Pour into nonstick square baking pan. Bake for 30 minutes. 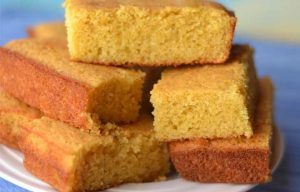 This cornmeal is really good for breakfast the next day. Put one square in a bowl and heat in the microwave for about 40 seconds. SprinklE with sugar and pour in about 1/2 cup milk. Eat it like cereal – it’s DELICIOUS! Mulate’s is known as the original Cajun restaurant, famous for preserving and celebrating the food, music and culture found in the small towns and along the bayous of south Louisiana. But the restaurant that prides itself on being true to its roots would never have opened its doors if owner Kerry Boutté hadn’t ventured out of Cajun Country and into restaurants and dance halls of New Orleans, Houston and even Europe. We have lots of wonderful recipes that you can enjoy at home. Click HERE to purchase our cookbook and some of our Cajun Seasonings.